Final Fantasy 7 will be making its PS4 debut sooner than we thought. Square Enix's website says that the RPG will arrive on that console this October. They changed the date for one of two reasons. It was either a placeholder date that isn't correct or Square Enix wasn't ready to reveal that information yet. 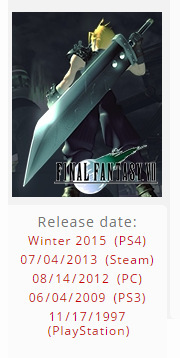 Either way, the fact remains that they expect to release FF7 on PS4 by the end of the year. Square Enix didn't remove the pricing information, though. They say that the PS4 edition of FF7 will cost $15.99. Furthermore, it's only going to be available digitally. This doesn't seem to be the full Final Fantasy 7 remake announced at E3 2015. The website only mentions the features of the recent PC re-release, like the character booster, cloud saves and Achievements. Sony had said they would release this PC edition on PS4 in the past. It was unclear whether they would go through with that plan once they revealed the full remake at E3, though. It's a little odd to release a straight port of FF7 and then later down the road release a remake on the same platform. It's pragmatic, though. Square Enix can make some easy money off the port while they finish up the remake. There are bound to be plenty of FF fans willing to buy the same game they've played and replayed over and over. I would be really tempted to delete things and add new elements, new systems or whatever because if we were to make exactly the same thing now, it'd be like a repeat. It'd be an issue of repetition and not as much fun to make such a game. So I'd be really interested in rearranging games or reshaping games into something slightly different even though it's supposed to be the same game. In that interview, Kitase noted that some long-time fans of FF7 might not be happy with these changes. That's where the port comes in. Players who don't want the game to be meaningfully changed can just get the PS4 port so they can enjoy the "traditional" experience.